In case you were ever wondering what you were missing by NOT being a posh mum in North London’s borough of Highgate, there is a Twitter account, @HighgateMums, that pulls the lid off of the conversation amongst the ladies who brunch. The list includes names like Biggles George Fittleworth and seasonal goose eggs, croquet and men in red pants. If you aren’t sure what posh actually means in the U.K., this will settle it for you for sure! Enjoy and have a great weekend! 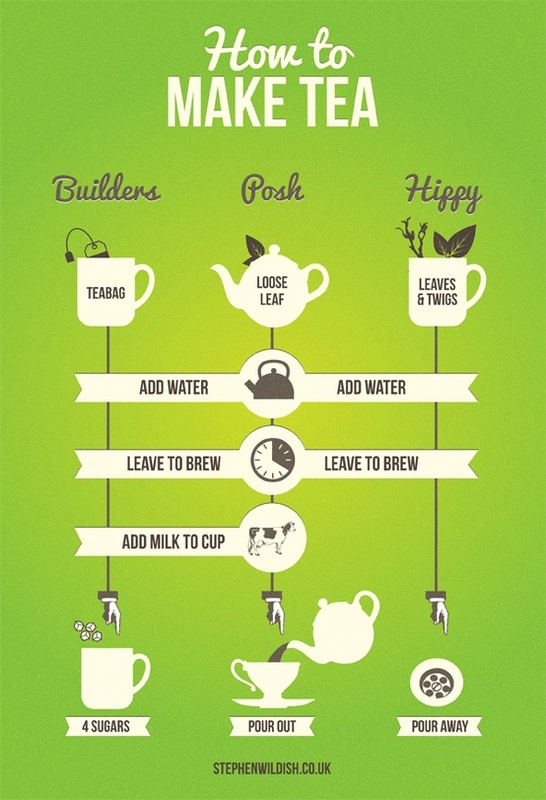 I love this simple little infographic, detailing ways to make three different cups of tea, courtesy of Stephen Wildish. How do you like your cuppa? I like a good builders’ tea, without the sugar!